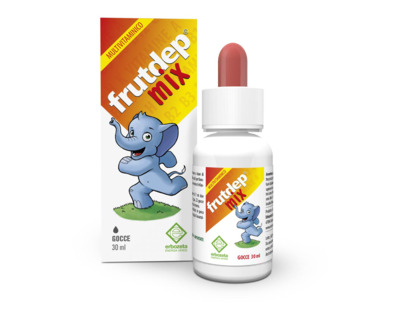 Frutdep® mix is a multivitamin food supplement useful to provide a supplementation of these nutrients in the daily diet. B Vitamins contribute to normal energy metabolism. Vitamin A and C contribute to the normal functioning of the immune system. Moreover, Vitamin C contributes to reduce weakness and fatigue. Vitamin D and K contribute to maintain healthy bones. Vitamin C, Vitamin B3, Vitamin E, Vitamin B5, Sodium fluoride, Vitamin B6, Vitamin B2, Vitamin A, Vitamin B1, Vitamin D3, Vitamin K1, Folic acid, Vitamin H, Vitamin B12. Take 1 ml of product a day, diluted in a glass of water or poured directly in your mouth. 12 drops correspond to the 1 ml mark on the internal dropper.